Get the sleek, flexible body that only Pilates can achieve! The Stamina AeroPilates Pro XP556 provides exercise resistance to help you comfortably, safely and effectively tone, strengthen and shape your body. Pilates exercises engage the core muscles of your powerhouse to improve your balance, coordination and flexibility. Get all the benefits of a Pilates studio workout right in your own home. The AeroPilates features a patented Free-Form Cardio Rebounder for a low-impact cardiovascular workout that burns calories and fat as effectively as a treadmill! This low-impact exerciser allows you to work and tone without joint stress. And, since youre lying on your back, there is no impact on your legs, hips or spine. Use the included instructional workout DVDs to develop stronger, leaner muscles and lose weight. The AeroPilates Pro XP556 uses the resistance of 4 heavy-duty elastic cords to enable over 100 effective exercises! 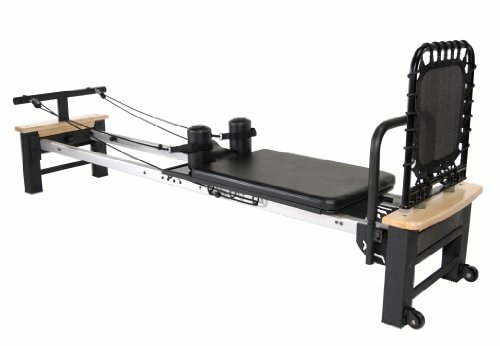 Also, the reformer is elevated about 15in for more advanced exercises! This comfortable and efficient machine includes longer rails (5in longer than standard) to accommodate taller users. The footbar adjusts to three positions for more individualized exercises with better range of motion. An adjustable headrest and oversized high density foam shoulder pads also provide additional comfort and support. The adjustable ropes, straps and hand grips ensure user safety. And, the ultra-smooth rollers and commercial grade wheels offer the benefits of security and convenience. With a heavy steel frame and oak-finished wood construction, this home fitness unit offers commercial-grade quality at an affordable price. This package includes two easy-to-use instructional videos and a full color workout chart so you can get the most from your versatile home unit. Maintain your target heart rate and build cardiovascular fitness while stretching and toning your way to a sculpted body with the AeroPilates and Free-Form Cardio Rebounder.